Pickup trucks aren’t known for being gorgeous, but the 2019 Toyota Tundra certainly is. With the 2019 Toyota Tundra, you can have beauty and brawn. We passionately feel that everyone can appreciate the exterior design of the 2019 Toyota Tundra for one thing or another. Stay with us as we discuss the 2019 Toyota Tundra exterior design features. The exterior lighting on a vehicle is one of the most important exterior features. They determine what type of view you will have driving at night or in foggy conditions. The 2019 Toyota Tundra comes equipped with Halogen headlights with LED Daytime Running Lights (DRL) with manual level control and auto on/off feature and integrated LED fog lights on higher trim levels. The lowest trim level also has Halogen fog lights, they just are not LED. 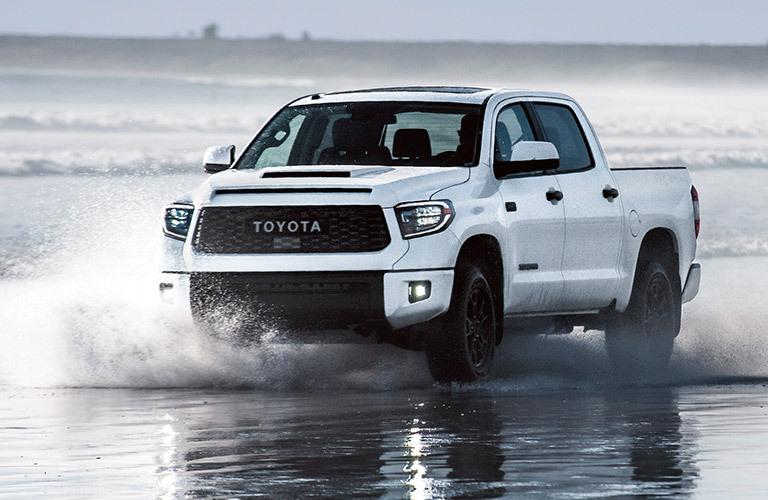 Look, and look again, because you will never get enough of the 2019 Toyota Tundra. Plus, there is a lot to take in from the gray grille with chrome surround and front chrome bumper endcaps to the stylish deck rail and tailgate caps. Furthermore, it has taillights and stop lights with dual vortex generators, black heated power outside mirrors, and a chrome “TUNDRA” badge on the driver and front passenger doors. Then there are the design features that exist more for functionality than fashion, such as the front and rear mudguards or the High Solar Energy Absorbing (HSEA) glass. Come into Lexington Toyota to pay the 2019 Toyota Tundra a visit. It might be hard to peel your eyes away, but we will let you look for as long as you need. Does the 2019 Toyota Tundra Offer Toyota Safety Sense? This entry was posted on Monday, February 4th, 2019 at 5:51 pm	and is filed under Toyota Tundra. You can follow any responses to this entry through the RSS 2.0 feed. You can leave a response, or trackback from your own site.